« What’s First? The House or the Mortgage? 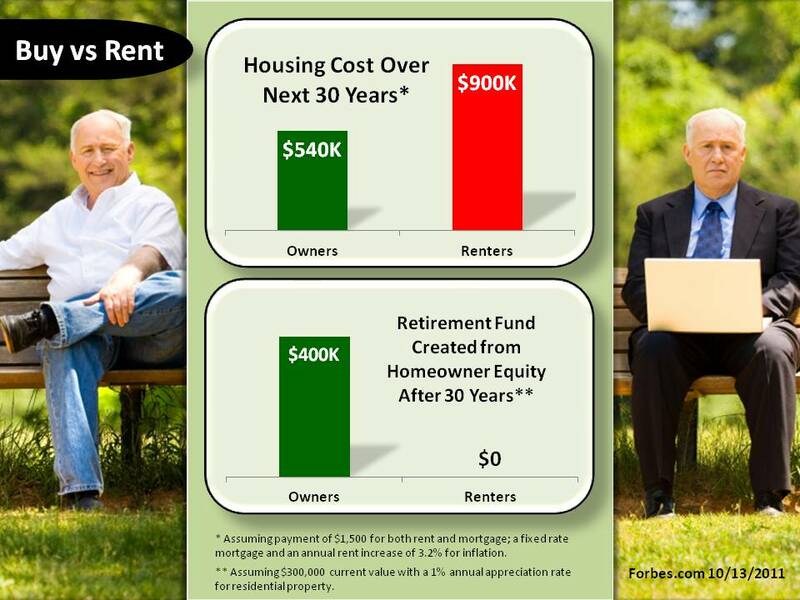 Yes, if a homeowner stays in a home for 30 years they will realize a significant financial gain. Of course, many of the people this blog is directed towards will have to find a new career if we start staying in our houses for 30 years. One of the reasons buyers are being more selective is they have realized that they need to make longer term decisions in regards to a home purchase. The “cost of waiting” is less than the “cost of making a hurried decision”. Be aware of taxes associated with home ownership (it can be significant in some areas) and other phantom costs such as general maintenance and upkeep. It looks like this assumption fails to calculate those into the equation. Does not pass my sniff test. In the New York New Jersey area taxes would total $300K for 30 year (and I am being kind and using todays taxes not what they will be in the future. Also omitted repairs which a land lord would pay for a renter. The home owner will go through about $10k a year in repairs over 30 years. (UVAC, roof, sideing, driveway, plumbing etc). The largest omission is the price fall of homes purchased from 1996 to 2005 and the number of home that are worth less than the mortgage. Even if you totally disragard the home value price fall – the infographic is inaccurate do to the hefty omissions. When you add in just a few those items its more expenisve for a home owner. Whoever wrote this article is as clueless as Mitt Romney when it comes to the economic pressure that 99% of Americans are under. Why would the typical American think that in 30 years they will be living in the same location? Why would the typical American think that a year from now they will have a job? Why would the typical American think they will be able to pay for that house when they drive down streets and see a sea of forclosures? I realize a lot of real estate agents have “drunk the lemonade” to buy & sell homes but the typical American is smart enough to lease insteads of fall into the trap of some banker to buy. The information on the graphs was not calculated by the National Association of Realtors nor the National Association of Home Builders nor the Mortgage Bankers Association. The information was reported by Forbes Magazine (as the InfoGraphic states), the iconic financial magazine in this country. If you believe that THEIR research doesn’t ‘pass the sniff test’ or that Forbes is ‘clueless’, so be it.